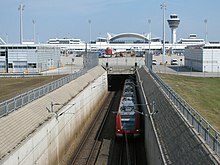 The airport is connected to the city by Munich suburban railway (S-Bahn) lines S 1 and S 8. The ride takes approximately 45 minutes to the Marienplatz station in the city centre. S 1 runs from the airport through the northwestern suburbs and reaches the city centre from the west (Hauptbahnhof – Marienplatz – München Ost), while S 8 comes in from the eastern suburbs passing the stations from the opposite direction. The S-Bahn from the airport to the city runs approximately 20 hours a day with a short break between 1:30 a.m. and 4 a.m.
635 connects the airport within 20 minutes to the Freising railway station, providing access to regional trains towards Munich as well as to Nuremberg, Regensburg and Prague. As of September 2015, construction works to connect the airport with regional railway services of Deutsche Bahn to and from the north-east had started. This project, called Neufahrner Kurve (Neufahrn curve after the nearby town of Neufahrn bei Freising), will see the existing southwest-bound S-Bahn tracks being expanded with a curve leading to the north, connecting them with the already existing tracks of the Munich-Regensburg line. This new connection will enable hourly regional express train services from Regensburg via Landshut directly to the airport without the need to use a connecting bus coming from the north or to go to Munich city center at first and then all the way back to the airport. The entire project is scheduled to be completed in December 2018. In order to reach the central station and the Munich city center faster the proposal of an express S-Bahn was proposed by the critics of the unsuccessful proposal of a Transrapid connection in 2008. 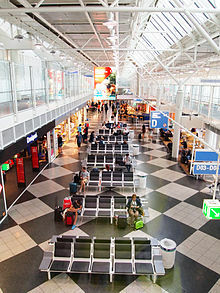 Due to the heavily utilized Stammstrecke (east west connection), its connection to the Munich East–Munich Airport railway is not possible, and the use of the Munich South Ring as an alternative would be a major time saving loss on the way to the main station. The central station could be reached directly from the airport via the Munich-Regensburg railway line, which, however, also does not offer regularly usable capacities. The neighboring communities oppose its development as the route leads through several local centers and crosses the federal road 471 in Oberschleißheim. Therefore, the new construction of railway lines for the implementation of an airport express would be necessary. The solution approach from MAEX via the Munich East–Munich Airport railway requires the construction of the second main route through Moosach and along the Bundesautobahn 92. The Erdinger Ring connection is to extend the S-Bahn (S2) from Erding in the direction of the airport and connect to neighboring Freising through a connecting curve, the Neufahrn Link. 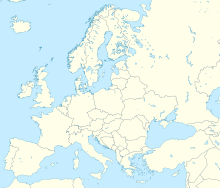 It will fulfill the demand of a rail connection between Eastern Bavaria, including the neighboring airport commuter cities Moosburg and Landshut, to the airport, realized with its own regional railway line. 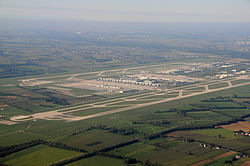 A faster connection from the airport to the inner city is not achieved by the Erdinger ring connection, however a direct connection between the airport and the Munich Messe would be. For this, the S2 would also make a short route north of Messe München and have a stop north of the exhibition center. Already before the opening of the airport there were plans for a regional station at the airport. To this, a railway connection from Mühldorf am Inn is to be made between Erding and Dorfen with the help of the Erdinger ring connection as well as a short new construction single-track called Walpertskirchner Spange. The actual planning phase for this also began, as in the case of the Erdinger ring connection, in August 2006. 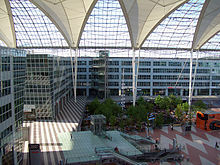 On 29 August 2013, the Bavarian Administrative Court rejected the complaints against the plan approval decision of the Neufahrn Link of October 2012 and therefore freed the way for a direct rail connection of the Munich airport from Regensburg, Landshut, Moosburg and Freising. 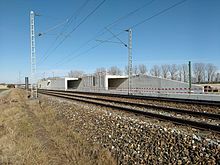 The Neufahrner Kurve is to connect the railway line Landshut-Munich from Neufahr with the railway connection line Neufahr-Flughafen Munich, approximately 2.5 kilometres long, two-track and electrified section of the line. In the construction and financing agreement, signed by rail and free-trade in April 2013, it was agreed that the Neufahrn Link will be built and put into operation by the end of 2018. ^ Alexandra Vettori (11 July 2016). "Wo bleibt der "Humpel-Express"?" (in German). Süddeutsche Zeitung. Retrieved 17 June 2017.